Santee’s Guenther Hanschke has spent most of his life fixing automobile engines. But while on a trip to Germany in 2013, Hanschke was faced with a problem he couldn’t fix. Hanschke did just that. He said the doctor told him his heart was failing. Hanschke checked himself into hospital for emergency heart surgery. He called his daughter Elke in San Diego to notify his health insurance provider, Anthem Blue Cross, and make sure the operation would be covered since it was out of the country. Elke Hanschke did just that. Elke flew to Germany to be with her dad for the operation. 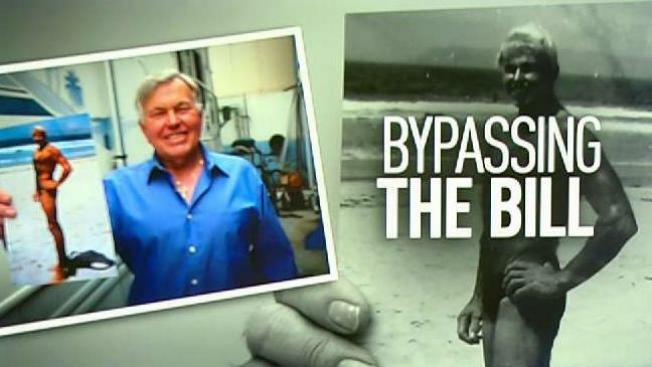 Doctors performed quintuple bypass surgery to unlog his arteries. The operation was a success. After weeks of recovering, Hanschke returned to Santee. Not long after his return he got a surprise letter in the mail. “Three months later I get a letter from the hospital saying when do you want to pay your bill,” said Hanschke. Hanschke said he spent weeks on the phone with Anthem, faxing them his medical bills but nothing happened. Hanschke said he dipped into his savings and borrowed money from friends. Hanschke said he paid the bill in 2014. Since that time, he has contacted Anthem numerous times in hopes of getting reimbursed. His daugher Elke alson contacted Anthem. “There was never a no, we are not paying, it was just that we were being put off,” said Elke Hanschke. In April 2019, Elke and her dad got an idea to contact NBC 7 Responds for help. Hanschke contacted NBC 7 Responds. We contacted Anthem. A day later Anthem reached out to Hanschke as well as NBC 7 Responds. “Within days of sending an email to the news, my dad got a phone call. I had received a phone call,” said Elke Hanschke. Guenther Hanschke said he is thankful for the help fixing what he considered was an irreparable problem.